Over the weekend, I finally had the opportunity to pour through the Saveur 100. In case you are not a subscriber, every beginning of the year Saveur lets readers share their favorite ingredients, chefs, tools, tips, etc., and they somehow narrow it down to 100. It is so enjoyable to read! Some standouts for me this year was #2: Eggs From Your Own Chicken (my dream), #7: Clarified Butter/Ghee (the best way for carmely cooked perfection), #11: Tastespotting.com (!) and #95: Nourishing Traditions (my cooking bible). The story that stuck out for me the most though, was #25: Foods That Inspire. In this segment, Donna Long from Weston, Missouri tells the story about her husband Doug, who not being much of a foodie, has an epiphany in a cooking class that he didn’t want to be at in the first place. The instructor has them roast radishes for their first assignment, and Doug, who has never liked radishes, is so pleasantly surprised by how much he likes them roasted, hasn’t stopped cooking since. 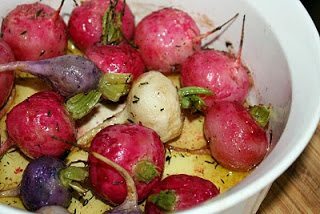 Roasting a radish inspired him to learn about spices, perfecting cooked fish and how to make the perfect omelet, and it inspired me to do a post on Saveur’s simple roasted radishes. Radishes are so different when cooked, losing all of their bite and becoming sweet vehicles for salt, pepper, olive oil and whatever herb you decide to cook them with. This recipe uses thyme, a spice I adore. The healthiest part of the radish is actually in the greens, so don’t throw them away when making this recipe and use them in another dish! The bulbs have great nutrients as well. Radishes and their greens are an excellent source of vitamin C. They also are a very good source of potassium, folic acid and the trace mineral molybdenum. 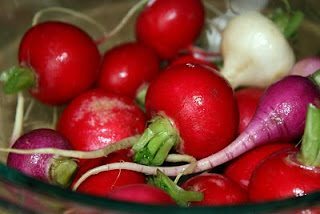 Radishes have been used for centuries for liver disorders, to improve digestion and to maintain a healthy gallbladder and liver. Heat oven to 425 F. Trim radish greens and wash the bulbs until clean. Pat dry with a paper towel. Toss radishes with the oil, thyme, salt and pepper in a large bowl. Pour into a shallow baking dish and cook for about 40 minutes. Turn them occasionally to ensure they don’t burn. Enjoy the dish that inspired Doug Long to become a foodie. Do you have a dish that inspired you to become obsessed with food? I’d love to hear about it! Great post! I was excited to read the Saveur 100 also. Always find great recipes in that issue. Beautiful colours in one dish… just wondering, are beet and radishes the same? @Jeannie: They are both root vegetables but radishes are from the Brassicaceae family and beets are from the Amaranth family. They also need to be prepared differently. Thanks for stopping by! I love the colours. And fresh radish are so good with simple olive oil and good salt. YOu know, I once had raw radish in a salad and I just couldn't get over that raw "bite" as you described so I stopped eating them altogether! I think you've just inspired me to try them again! Great story. Roasting radish sounds so simple, yet I had never thought about it. I bet they are really good. They look so beautiful, too. Every bright coloured vegetable is my favourite. They are high in vitamins. I love these cute radishes, even great to eat raw. Looks very delicious roasted too. I'll try some time. Thanks to butter and salt, I have recently made peace with the radish, and so I am eager to try them roasted! Neat! 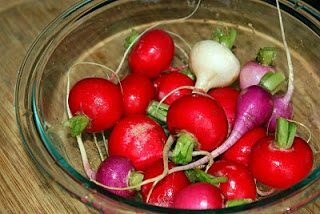 It never occurred to me to cook radishes… I've always eaten them raw, either on their own with a sprinkle of salt or tossed into a salad. Sounds like roasting them would be really simple and delicious, though. I must try to roast radishes, sounds delicious! I've only eaten radishes raw so far! These look beautiful! I was inspired by my Nana's raviolis, loved helping her make those. These roasted radishes look so beautiful and sound delicious! I am going to try them cooked with your guidance. First of all, I share your dream of 'eggs from your own chicken' – I seriously considered raising a couple of chickens in our yard and even found some awesome, portable coops called Egglus. But I digress . . . These roasted radishes look wonderful! If I really stop and think about it, I could probably come up with one dish that had an impact on my food obsessions. But it's a constant menu of discovery and I feel re-inspired with every new dish! 😎 Lovely post! Something so simple yet so perfect. Going to make these tomorrow! It never would have occurred to me to roast radishes, but this looks delicious! That is a great story about Doug and radishes. Isn't it amazing how cooking one ingredient can completely change one's relationship with food? Excellent post. My Greek grandfather used to make radishes this way. He'd also cook the green tops (frugal man that he was). I remember as a little girl just loving the transformation this had on the radishes. Radish leaves make a great pesto……which I haven't made yet but will do in a few weeks :-). I've never thought of cooking them!!!!!!! for more information, to get unique link to claim and customize your profile. Please visit http://cookeatshare.com/blogs/apply for additional information. Just wanted to let you know I tried these yest and they were yummy and buttery. I like them with a lot of salt! I never know what to do with radishes other than raw…love this! Thank you! So colorful and fresh-looking! Must try this roasted radishes when they're in in season. Love the color. I just got some beautiful radishes in my produce box today. Now I know what I'm going to do with them! Glad I found your blog!